Inflammatory bowel diseases (IBDs) are the result of pathological immune responses due to environmental factors or microbial antigens into a genetically predisposed individual. 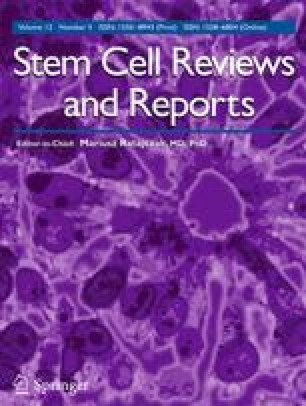 Mainly due to their trophic properties, a mounting interest is focused on the use of human mesenchymal stem/stromal cells (hMSCs) to treat IBD disease in animal models. The aim of the study is to test whether the secreted molecules, derived from a specific population of second trimester amniotic fluid mesenchymal stem/stromal cells, the spindle-shaped MSCs (SS-AF-MSCs), could be utilized as a novel therapeutic, cell free approach for IBD therapy. Induction of colitis was achieved by oral administration of dextran sulphate sodium (DSS) (3 % w/v in tap water), for 5 days, to 8-week-old NOD/SCID mice. The progression of colitis was assessed on a daily basis through recording the body weight, stool consistency and bleeding. Conditioned media (CM) derived from SS-AF-MSCs were collected, concentrated and then delivered intraperitoneally into DSS treated mice. To evaluate and determine the inflammatory cytokine levels, histopathological approach was applied. Administration of CM derived from SS-AF-MSCs cells reduced the severity of colitis in mice. More importantly, TGFb1 protein levels were increased in the mice received CM, while TNFa and MMP2 protein levels were decreased, respectively. Accordingly, IL-10 was significantly increased in mice received CM, whereas TNFa and IL-1b were decreased at mRNA level. Our results demonstrated that CM derived from SS-AF-MSCs cells is able to ameliorate DSS-induced colitis in immunodeficient colitis mouse model, and thus, it has a potential for use in IBD therapy. Whittem, C. G., Williams, A. D., & Williams, C. S. (2010). Murine colitis modeling using dextran sulfate sodium (DSS). Journal of visualized experiments : JoVE, 35. doi: 10.3791/1652.